American began testing Main Cabin Extra premium economy seating on a few flights this summer and now it looks like their starting to roll it out to more and more planes. There’s been a discussion over at Airliners.net about a number of AA 767-300s seen parked at the San Diego airport the last few weeks. It turns out that these planes are there because they’re being configured with American’s new Main Cabin Extra premium economy seating. So far 10 of American’s 58 767-300s have been reconfigured. It doesn’t look like any of them are being used consistently on any particular route, instead they’re being rotated on mane different routes like Chicago to/from London, Miami to/from Madrid, DFW to/from London, a couple of flights to South American. The DFW to/from LAX route looks to be the only domestic route that’s (so far) been serviced by one of the reconfigured 767-300s. Want to know if your next 767-300 flight will offer Main Cabin Extra? Here’s a list of the registration numbers for the ten planes that have been through San Diego. You can click on any of these links to track them on Flight Aware and to see where they’ve been and where they’ll be used next. Maybe you’ll get lucky and one of them will be used for your next 767-300 flight. 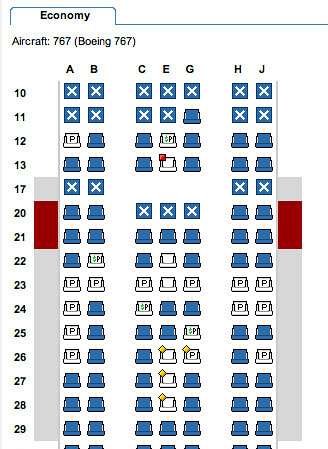 Compare it with this “normal” 767-300 chart and you’ll notice the difference with rows 10 through 13. In case you’re wondering, they didn’t make any changes to the number of First/Business class seats they offer on the 767-300. Instead it looks like they just removed a row from economy. Has it been offered on any of your recent flights? Did you try it? If so, let me know what you thoughts about it and share your review in the comments section. Showing on lots of domestic 763 flights to HNL from LAX and DFW. Any idea of the refresh schedule on the 767-300? I’m flying to Helsinki on June 30th and I’m wondering the odds of that 767 being new. @ Peter – The 767-300 refurb program has been completed, so you’lll have the chance to try out Main Cabin Extra on your way to Helsinki. Hope you have fun and safe travels! Does the 767-300 has the Panasonic AVOD installed? @ Drew – No, for customers in First/Business class they offer Samsung Galaxy tablets preloaded with movies and television programs. I believe that customers in the main cabin still have to view shared monitors. I’m flying business class. I’m wondering if since it has the Main Cabin extra, does that also mean that it has the new business class product? 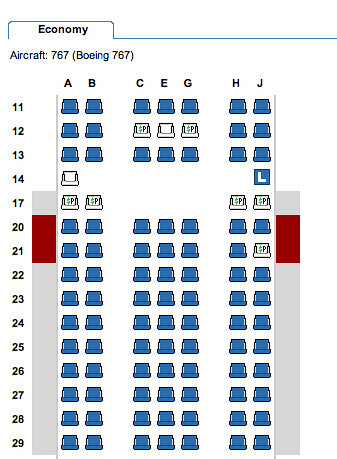 @ Peter – If you’re flying Business Class on the 767-300 it will have the “Next Gen Business Class” seat (NGBC). It’s the same Business Class seat you’ll find on American’s 777-200s. Ben has an excellent (and detailed) trip report of his experience in Business Class on the 777-200, you’ll have the same seats on a 767-300.